In today’s world, families move fairly often. However, moving can be really difficult for children and teens to go through. How do you tell kids about the move? How do you help your kids make new friends? What are the curriculum gap watch-outs when transferring schools? All these types of questions and more arise when moving with kids. 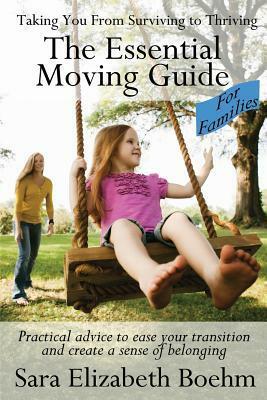 Sara Boehm recently published a book called, The Essential Moving Guide for Families, that gives practical advice on how parents can guide their children through the move and settling in process in a way that will help to address the emotional challenges of moving. Here she shares with us an exclusive excerpt from the newly released: The Essential Moving Guide For Families (affiliate link below). This is book excerpt is from Chapter 4. Copyright © 2014 by Sara Elizabeth Boehm. Reprinted with permission of Essential Engagement Services LLC. All rights reserved. Determining when to move is often an aspect over which you have little control; however, there may be some elements which offer more flexibility. At the very minimum, you’ll need to put some thought into the best time for your children to start at their new school. Parents who move their children for the first time often believe, or have heard, they should move their children in the summer so they can finish the school year in one place. This would give them the entire summer to transition and then start their new school on the first day so they don’t miss part of the new year. In my experience, and in the experience of others who I know, this isn’t always the best time to move. It’s worth taking all the alternatives into account before making your decision. Also, if you know of a school in the area you might be interested in, consider calling the school board ahead of time to check on their enrollment timing and policies (some school districts, especially private schools, may have restrictions that you will need to incorporate into your planning). Be strategic in your decision. If your son or daughter struggles academically, beginning on the first day of the new year (or at mid-term) can minimize any disruption in his or her studies. If your child isn’t struggling academically and doesn’t need to begin at a specific time for sports or activities, social concerns should be considered. With those in mind, starting on the first day of the academic year may not be an ideal start date. On the first day back to school, the other students are less likely to notice your child or look out for them because they’re too consumed with the excitement of seeing their friends and catching up on what they did over the summer. A new student will often fall through the cracks. If you’re moving in the fall or summer, it may be better to wait a few weeks for the excitement to die down before starting your children. They won’t miss much in terms of curriculum and will be more likely to be noticed by both the students and the teachers. Other students, once back to the normal grind, will be interested in reaching out to new students and more likely to offer them help. As your children get older, their classmates sometimes become more insecure and less welcoming than those in elementary school. Your child may prefer to blend in by starting at a time when they’re less likely to stick out and should be involved in this decision. This isn’t a hard and fast rule; while many children and teens will appreciate their peers noticing and offering to help them, there are some children who will prefer to remain anonymous and their preferences should be taken in to account when possible. Walk them through the pros and cons of each option and solicit their thoughts. If the move occurs during the summer, you won’t have to disrupt your child’s school year. However, unless you have activities to keep your child busy, summer can be a very lonely time to move. It may be harder for your children to meet friends in your new town as summer is usually when kids go to camp or vacation with their family. This creates a lot of alone time and your child may become bored or sad and miss their old friends. Without the benefit of being able to work on new friendships that will make their new home fun, your children will focus on their old home. It’s human nature to miss what we have lost or don’t have anymore. We’re all more likely to become depressed when we’re left alone with our own thoughts for too long and can’t take action to make the situation better. If you do move in the summer, look into summer programs and camps in your new area to try to combat the isolation that can come with relocating when school is not in session. My friend Emily’s family moved early in the summer as she was preparing to enter ninth grade to ensure she was there in time for water polo tryouts. While the timing worked to ensure she could make the team for the upcoming school year, she still can remember the loneliness she felt for most of the summer as she sat around at home for the two months before the school year started. For moves that occur later in the year, in some cases, it may be best for one spouse to stay behind with the children so they can finish the school year in their old school. However, if there’s enough time left in the school year to make friends, it may work out well to move your children so they can begin to make friends and establish themselves in the new school. They’ll then have a chance to make some connections for the summer and should feel more comfortable starting school the following year with a few familiar faces. The decision is up to you and your children and it’s heavily dependent upon your unique situation (how much time is left in the year, how far you’re moving, the age of your child). You can’t always control the timing of a move and sometimes there’s no choice but to relocate during the middle of the school year. While, as previously stated, this may benefit the child, as teachers and students will look out for and help him or her, it can also create challenges with the curriculum. Because lessons are sometimes taught in a different order in each school district, the old school may not have gotten to a lesson that the new school has already covered. Your children would then miss that portion of their lessons. This doesn’t always cause issues, but can lead to frustration and disappointment. If the course work is an essential building block for future work, you may need to get your children up to speed, either independently, with a tutor, or with your help. If you have to move during the middle of the school year, consider taking the lessons and curriculum from the old school to the new one and meeting with the school administration to discuss any gaps. Consider resources like the Khan Academy for catch-up lessons from the comfort of your own home. While a mid-year move creates complications as classes and activities are in full swing, care, planning, and support will ease the transition. Thanks again to Sara Boehm for sharing her advice for those moving with kids. If you want to read more, you can get her book at Amazon. Feel free to share your experiences moving with kids in the comments. This book is a must-read for everyone who is about to get through moving! I’ve done this twice in the last two years and I’ve gotta tell you – it hasn’t been the easiest of times. Moving is all about good planning and good timing, never forget that!